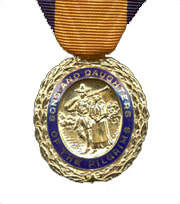 Welcome to the National Society Sons and Daughters of the Pilgrims website. The website is currently under construction. If you don't find what you need, please check back later. If you have information to submit for the website, please send it to NationalSSDP@gmail.com. For over one hundred years, the National Society Sons and Daughters of the Pilgrims has been dedicated to preserving both the genealogies and histories of our Pilgrim ancestors. From the foundations of American religious freedom, to Thanksgiving, to early Colonial history itself, the individuals from whom our members descend played a vital role in the development of our national identity. At the time the Society was founded, on December 21, 1908, ten gentlemen met in Providence, Rhode Island, at the invitation of Dr. Thomas Williams Bicknell. There they organized the Society, which was incorporated in Rhode Island on December 21, 1909. Dr. Bicknell died in 1925 at the age of ninety-one. He was a teacher, lecturer, member of the Massachusetts Legislature, and the father of three children.